An intimate event that will see you not only eat and drink in a Sicilian manner but learn as you go. The event will be conducted by Phil Smith, owner and creator of The Wine Depository. The Wine Depository is a Melbourne-based bespoke wine retailer and consultancy here to challenge how and when we drink wine. We offer a hand picked (and rigorously tested) range of wines to either enjoy now or tuck in the cellar. We’re known for rare and hard to find wines, lesser known varietals and smaller producers. 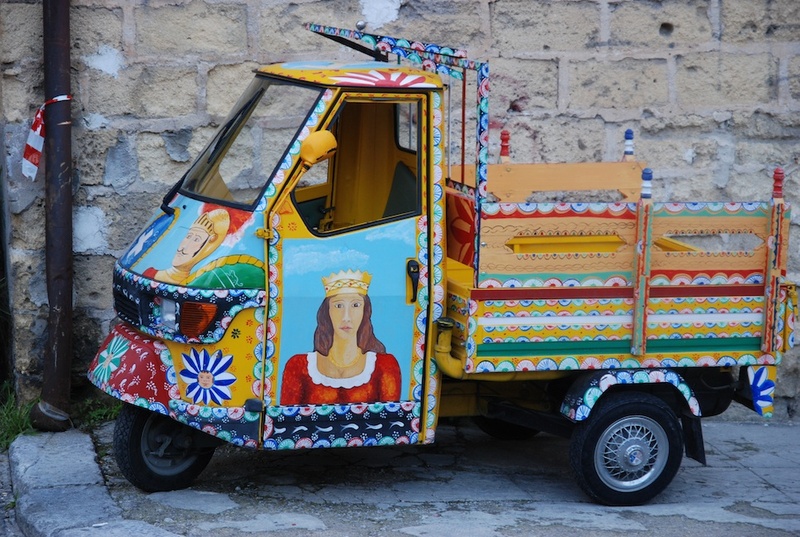 Sicilian Wine and Food Experience is one of these events. Phil knows that every time you taste a wine it is an event and it can be educational. He effortlessly brings these elements together in his wine tasting events, whether a casual tasting or a Masterclass over dinner. The emphasis is on good wines that will broaden your wine drinking knowledge or at the very least be extremely yummy. The Wine Depository often brings a knowledgeable and engaging speaker to take you through the wine selection. When in Sicily eating Spaghetti With Sea Urchins (Spaghetti chi Ricci) is a must. They are relatively unknown culturally in Australia and have been next to non-existent commercially. Sea urchins have a unique taste – they are considered a delicacy by Italians and are popular particularly with the Japanese, French, and Greeks. The gonads of both sexes of sea urchins are referred to as roe (which sounds nicer than testes and ovaries). They are called ricci in Italy (means curly, the spines of sea urchins are curly at the ends) and when I was a child visiting Sicily, I remember finding sea urchins under rocks on the beach — family and friends wrapped their hands in newspaper and went looking for them at low tide. Most of the time it was very easy to find 4 to 6 sea urchins for each of us to eat raw — the urchins were simply cut in half using a very sharp knife, revealing the yellow-orange roe that was easily removed with a teaspoon and eaten from the spoon with a squeeze of lemon juice. The next favourite method of eating them was as a dressing for pasta. In my book, Sicilian Seafood Cooking there is a recipe for this. I had great trouble finding sea urchins to cook (and to be photographed) for my book that was published November 2011. At the time I found it surprising that there are about 42 species of sea urchins found in Australian waters and although they can be found in many locations, only a few are good tasting. Most are exported to Japan. The market price for fresh, chilled sea urchin roe varies considerably depending on colour and texture. The Tasmanian sea urchin fishery is now the largest in Australia and I purchased Tasmanian roe from a specialist sea-food vendor (Ocean Made) who deals mainly with restaurateurs. I found some whole sea urchins at the Preston Market but when I opened them I found them very inferior in quality. In the photographs (from my book Sicilian Seafood Cooking) you see the work of the photographer Graham Gilles and food stylist Fiona Rigg. I was the cook. The photo of the boats at Mondello (Sicily, close to Palermo) is by Bob Evans. Spaghetti are traditionally used for this recipe, but I also like ricci with egg pasta, either fresh or dry — narrow linguine — a delicate taste, which in my opinion complement the sweet, fresh taste of the roe. I ate my best ever pasta with sea urchins in a restaurant in Mondello (close to Palermo) and I am sure that this included lemon – grated peel and juice so I have included these in the recipe. And one last thing — the sea urchins are not cooked and are mixed with the hot pasta at the time of serving. The aroma is indescribable. Bottarga is sometimes grated on top of the pasta and anchovies are commonly added to the sauce to accentuate the taste, but this is optional. ½ cup of your best quality, extra virgin olive oil to drizzle on top of the pasta at the end. If you have purchased whole sea urchins, using a short and very sharp knife or scissors cut into the shell and enter the riccio di mare via the mouth (you will see the opening). Split the sea urchins in half and remove the soft urchin flesh using a spoon. Place the roes into a bowl and discard all the rest. Break up the sea urchins into smaller pieces – they are soft so use a spoon. Cook the pasta and while the pasta is cooking prepare the sauce. Heat the ¾ cup of olive oil, add the garlic and over slow heat cook the garlic slowly until it becomes translucent. Add chili and anchovies – the anchovies will dissolve in the hot oil. Add this mixture of oil to the hot just drained pasta at the same time as the sea urchins and toss quickly to coat. Add the parsley, lemon peel and the juice. Toss well to combine. Serve immediately and top each portion with a drizzle of your best olive oil – this is best done at the table. Sea urchins, sometimes called sea hedgehogs, are the black, spiky creatures that lurk at the bottom of the ocean. They prey on the kelp beds that are a vital habitat for the rock lobsters and abalone of the north-east coast of Tasmania and are considered one of the state’s worst marine pests. But have you ever thought of eating them? Diver and seafood exporter Dave Allen has helped pioneer the sea urchin export industry in Australia and, in the process, has set about saving the reefs from being stripped bare by these pests. Laura Banks. From Sunday Age, March 2, 2014. I was pleased to see that sea urchins will be featured in a dinner called The Delicious Pest at The Melbourne Food & Wine Festival on March 9, 2014. Sea Urchin Roe is seasonal and as mentioned above, it is available from (Ocean Made), fresh and frozen when it is not in season. We deliver all over Melbourne and Australia wide. We use air freight and provide the freshest sea urchin roe available across the country. All our processing is done with the highest degree of care in order to make our product the best and we pride ourselves on excellent customer service and quality of product. Last year we won a Victorian seafood of the year award for best customer service and quality of product. We have a minimum order of 20 X 100gram or 150 gram punnets. If that seems too much then you could suggest our products to friends to see if they would like to be included in the order. Please also note that when we have further shops open in Victoria then we will list them on our website. Customers can also sign up to our newsletter and stay informed of seasonal conditions, new products or anything regarding sea urchins. Our new prices for 2015 are being implemented as we speak. Welcome to Sea Urchins Australia. Small Fishy Bites celebrates the diversity and versatility of seafood. These recipes recognize the popularity of serving small helpings with easy, casual and varied dishes. Small morsels are convivial fare that can be shared at social gatherings or as an accompaniment to drinks. They are an easy and pleasant way to sample a range of flavors without the commitment to one entrée or the different courses. Small Fishy Bites is my second book. Some of you may be familiar with my first book Sicilian Seafood Cooking which includes 120 traditional Sicilian recipes for fish and its many accompaniments – first, second course dishes, sauces and contorni (side dishes). 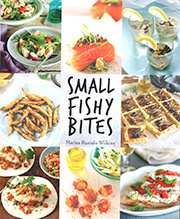 The recipes in Small Fishy Bites reflect reflect the widening repertoire of cuisines we are exposed to in Australia, especially the Asian and Mediterranean flavors, especially Italian. In the above class at Mercato the emphasis will traditional Italian style antipasto – small fishy bites cuisine, accompanied by wine. For convenience sake the menu for the cooking class has been divided into Starters, Entrées and Mains, but all the easily prepared dishes can be presented for any course – only the quantities may vary. Like a true Sicilian, Marisa Raniolo Wilkins is a lively fusion of cultures and experience. She was born to Sicilian parents in Ragusa, but she spent her childhood in the far northeast of Italy in the famous port city of Trieste, where her parents had met. 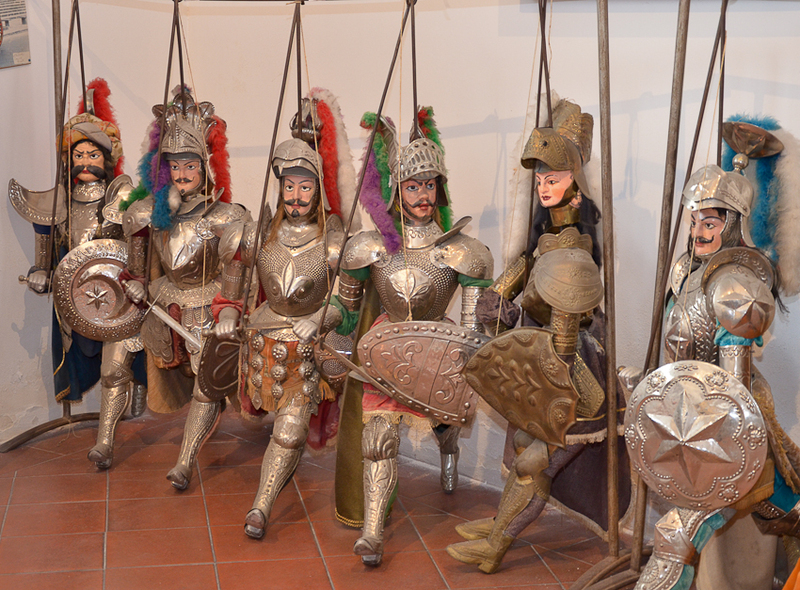 In her summer holidays Marisa would travel to Sicily to visit her relatives. This was where Marisa learnt about food and cooking from her Sicilian relatives. “My mother always told me that my father’s family knew nothing about cooking, but it was my father’s sisters who were some of my greatest inspirations in the kitchen,” Marisa says. Marisa and her family migrated to Australia in the late-1950s and settled in Adelaide, not far from where Imma and Mario established Mercato. Growing up in Adelaide, Marisa always kept in touch with Sicily and maintained her interest in flavours and ingredients. Over the years she has travelled to Sicily many times to visit her extended family, adding to her store of first-hand experience with every visit. Marisa enjoyed a successful career as a teacher and educationist in South Australia before moving to Melbourne in early 2002. 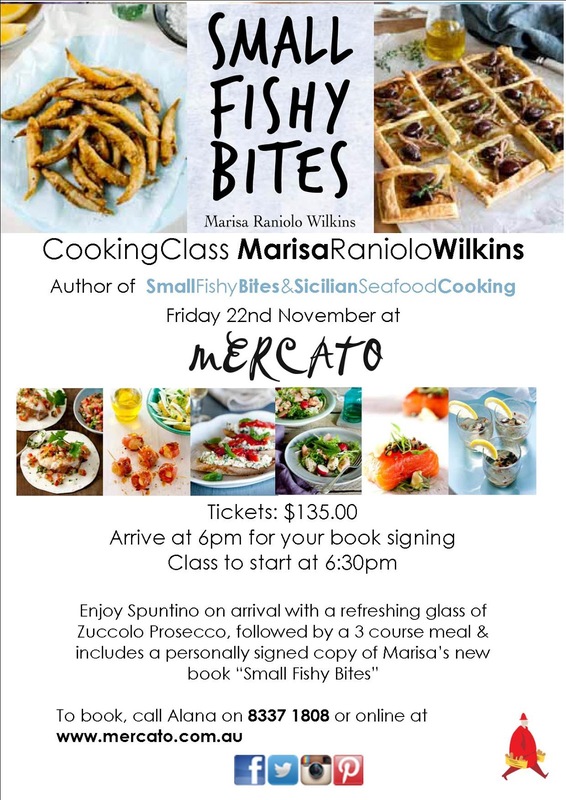 As she was getting settled in Melbourne, and in between jobs, Marisa rediscovered her passion for writing and her ambition to write a book about Sicilian cuisine and to document some of the classic, local Sicilian dishes cooked by her grandmothers and aunties and food that she has eaten throughout the island of Sicily. The result, eight years later, is her book, Sicilian Seafood Cooking, published by New Holland in November 2011. Modern takes on traditional Sicilian dishes. Although Sicily is not a large Island, the cuisine varies considerably from region to region. In this food workshop & cooking demonstration Marisa Raniolo Wilkins, author of the book Sicilian Seafood Cooking, will prepare and demonstrate the ways Sicilian cuisine has been shaped and influenced by the dominant cultures of the Mediterranean from the ancient times to the modern day, which includes Greek, Roman, Arabic, French and Spanish cultures.Marisa will share her experience in the kitchen and her love of Sicilian Cuisine. ingredients that reflect the seasons. 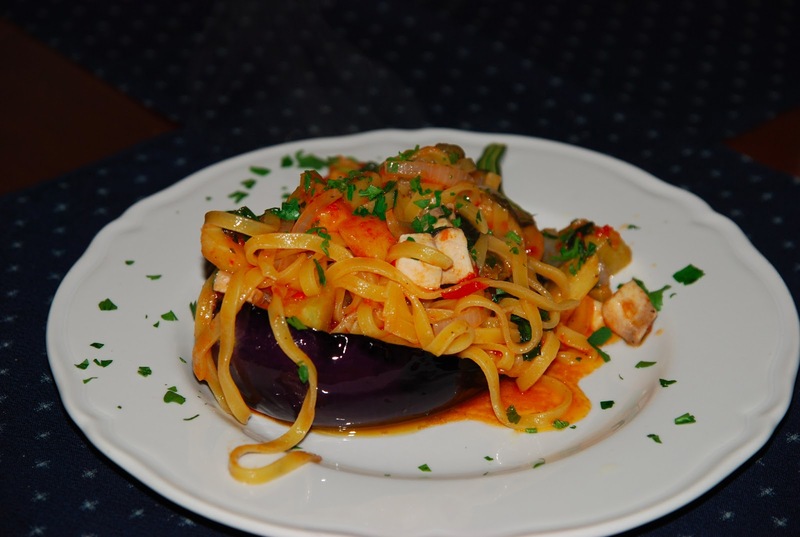 Pasta alla Norma is a traditional dish from Catania. In modern restaurants & kitchens it is now presented in a variety of creative ways that reflect the inevitable fusions of cuisines across the world. Marisa will prepare different variations of the dish that she experienced in her recent trip to Sicily, including some that use fish. Paired with 2009 Baglio Curatolo Nero d’Avola, SicilyCucciaYou will also experience a modern version of a very ancient dessert called Cuccia that has deep-rooted religious and seasonal associations. This class starts at 6.30pm and runs for approximately 3 hours and includes detailed recipe notes, delicious food matched with a tasting of Italian wine and informative, fun conversation. This class has a limit of 16 people. I have had the most wonderful seafood meal in Catania at the “La Vecchia Quercia” in the Garden Hotel in San Giovanni la Punta. I was a guest of Ristoworld an online not-for-profit organization dedicated to the restaurant and food production industry whose aim is to showcase Italian food internationally. Ristoworld has organised many congregations and competitions to promote culinary skills in the restaurant and hotel trade. This is an organisation that was first formed in Sicily in 2008, by Andrea Finocchiaro a chef who is based in Catania. This group has grown significantly and there are now delegates and representatives from all regions of Italy and from other parts of the world. I am the Australian delegate. Apart from Andrea and Fabio Trefuletti (secretary) I met other members of the group. The food was cooked by Costantino Laudani, head chef at La Vecchia Quercia (he is also the delegate of Sicily for Ristoworld). My charming waiter and sommelier was Allessio Valenti (vice president of Ristoworld). Apparently Alessio is Catania’s best cocktail maker. Pity I am not into night life! Unfortunately not all of the food was photographed. The antipasti were spectacular and there were so many of them…..marinaded fish, prawns, mussels, octopus……caponata with grated chocolate, cuscus. We said no to fruit and dessert – we just could not have fitted it in. La Trobe in the City is designed for anyone with an interest in history, literature and / or ancient cultures. This is one of the workshops offered as part of the lecture series. This session will commence with a lecture on the history of food and feasting in Sicily, Italy and the Mediterranean. Gillian Shepherd will focus on the literary and archaeological evidence for food production and consumption in the ancient world. This will be accompanied by a food workshop. Yesterday I visited La Trobe University at Bundoora to check out the venue and finalise the recipes for a demonstration/cooking class I am giving as part of the university’s lecture series on the cultures of the ancient Mediterranean. The food that I’ll be talking about and cooking for the class reflects the ways Sicilian cuisine has been influenced by the dominant cultures of the Mediterranean from ancient times to the modern day, which includes Greek, Roman, Arabic, French and Spanish cultures. 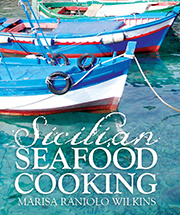 Some of the recipes will be from my book Sicilian Seafood Cooking. Since my cooking demonstration is planned for the weekend before Easter, it was natural to select some foods that would be prepared in Sicily at Easter, which is one of the most significant times of the year for Sicilians. 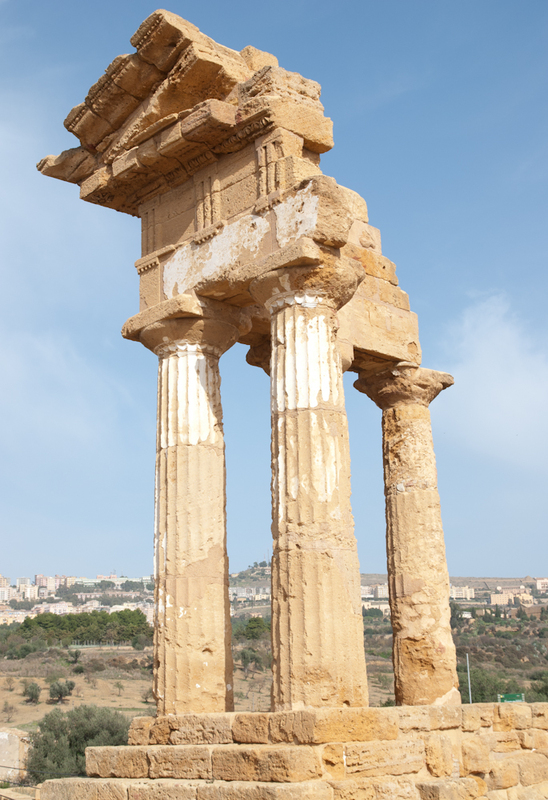 Whether they were ruled by Greeks or Romans, Arabs or Spaniards, Easter in Sicily marks the start of Spring and a time of celebration. It should be a very interesting session and I hope to see you there. Dr Gillian Shepherd is Lecturer in AncientMediterranean Studies and Director of the A.D. Trendall Research Centre for Ancient Mediterranean Studies at La Trobe University. Gillian studied Classics and Fine Arts at theUniversity of Melbourne before going on to complete a PhD in Classical Archaeology at Trinity College, Cambridge, followed bya research fellowship at St Hugh’s College,Oxford. Until her recent return to Australia to take up her position at La!Trobe University, Gillian was Lecturer in Classical Archaeology at the University of Birmingham, UK. Her research interests are the ancient Greek colonisation of Sicily and Italy, burial customs,and the archaeology and art of Greece and Magna Graecia.